Hard to read, crooked, and can’t get all the information on it. Nurses must ride the elevator to another floor to print another card instead of tending to patient. Quick ROI when replacing with thermal printer system. 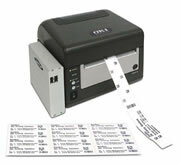 Our label printers are commonly used in many admitting and nursing departments, and they present an efficient solution to the blue card stamp plates that many hospitals are using to put patient identification on forms and documents. The imprints from blue card stamp plates are hard to read and the entire system is awkward and expensive to maintain. In comparison, thermal printed labels are much easier to read, more convenient, and can print barcodes. To qualified hospitals DataRay can offer a complimentary cost analysis ROI comparing your existing embosser card or laser printer based hospital admitting system to the DataRay bar-coded wristband and label printing solution. This study is an extremely thorough 5-page Excel report that includes your hospital’s own current equipment costs and maintenance expenses. The use of this tool has allowed many hospital admitting departments to obtain the needed funds to transform their admissions process from an illegible and unreliable embosser or laser printer-based system to the latest in bar code technologies. Providing your custom hospital figures to senior officers will reveal the substantial savings to be attained and the invaluable advantage that can be achieved in regard to patient safety. Hospitals have been reporting to us that laser printers waste labels, jam labels and ooze the label glue into the mechanisms causing endless maintenance problems and expense for their IT departments. 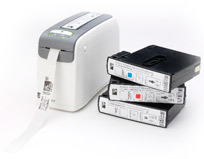 Our label printers do not jam labels, are small, very fast, durable, quiet, and have excellent print quality. You can also easily print barcodes with them, which is something many hospitals are being pressured to do for both quality control and efficiency reasons.